Sheriff Benny Napoleon when he was running for mayor. Photo by Steve Neavling. Wayne County Sheriff Benny Napoleon was elected to enforce the law, but when it comes to raising money for political office, he is among the most brazen scofflaws in the state. A Motor City Muckraker analysis of campaign finance records found that Napoleon is a chronic, repeated abuser of the Michigan Campaign Finance Act, all but thumbing his nose at the state law that governs donations to politicians. Napoleon is running two political campaigns simultaneously, collecting tens of thousands of dollars a year for his sheriff’s committee and a mayoral committee that he should have closed after his defeat to Mike Duggan in November 2013. But Napoleon’s campaign ended with a $92,100 debt in violation of state law, preventing him from closing the committee. The former Detroit police chief failed to report a $2,500 donation made on March 19 from the mayor’s political action committee, the Duggan Leadership Fund. Napoleon collected donations from at least three corporations, which is a violation of state law. The Wayne County Clerk’s Office fined or warned Napoleon over campaign violations numerous times for late filings, dubious reports and failing to disclose details on more than 80 expenses. Napoleon blamed more than $20,000 in unaccountable expenses on a credit card hacker who had gone unnoticed from May 2017 to November 2017. Intentionally violating the Michigan Campaign Finance Act is punishable by up to 90 days in jail, and in some cases, five years in prison. Elected leaders also can be prohibited from running for future office. When Napoleon’s mayoral campaign came to an end with his defeat to Duggan in November 2013, the 62-year-old was forbidden from closing his committee until he paid off more than $90,000 in debt, primarily to attorneys, political consultants and public relations firms. The Michigan Campaign Finance Act requires candidates to keep committees open until the debt is paid off. Nearly five years after Napoleon lost his mayoral bid, his committee remains open because he still owes $68,910. Candidates are permitted to raise money, but only to pay down the debt. According to campaign finance records, Napoleon used his mayoral campaign to raise $34,678 in 2014 and $27,600 this year. Of that, the third-term sheriff only paid $23,910 toward the debt and spent more than $11,000 in violation of state law on a consultant and unknown campaign material like buttons, bumper stickers and t-shirts. Gil Flowers, the campaign finance manager for the county clerk, recently sent Napoleon a second letter to remind him he was violating the Michigan Campaign Finance Act by misspending his mayoral campaign donations. According to state campaign finance filings, the Duggan Leadership Fund donated $2,500 to Napoleon’s mayoral campaign in March. Napoleon’s campaign treasurer, Roger Short, denies ever receiving the donation. It wouldn’t be that unusual for Napoleon to receive a donation from Duggan’s PAC. 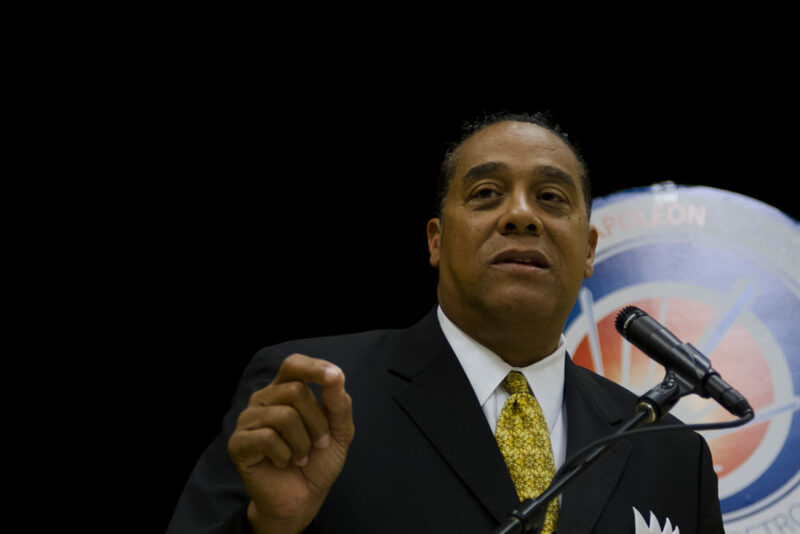 In the 2017 mayoral election, Napoleon endorsed Duggan over state Sen. Coleman Young II. Duggan also endorsed gubernatorial candidate Gretchen Whitmer, who was considering Napoleon as her choice for lieutenant governor. Earlier this month, Whitmer chose Garlin Gilchrist II, another Duggan ally. Napoleon, a robust fundraiser, has chosen not to tap into his sheriff’s campaign to pay down the debt, while spending tens of thousands of dollars on out-of-state travel, hotels and more than 200 meals. Up next, Motor City Muckraker reveals how Napoleon has spent more than $1 million in donations in the second part of an ongoing series about campaign donations. Other installments will examine a suburban mayor who approves contracts to the highest bidder, a formidable political machine funded by special interests and donations in the gubernatorial race.